TurboCAD LTE Pro is rich in fundamental drawing tools and drawing aids that speed design. A variety of visual styles are also available so that materials, fills, and transparent fills and gradients can be used to add effects and visual clarity. Lines and custom line styles allow for color or width by layer. Polyline segments may have differing starting and ending line widths. Other speedy features include the quick and easy creation of views and viewports of any size and shape, and access to extensive paperspace and printing capabilities, marker and schedule tools, leaders, multi-leaders, dimension tools, and symbols content. 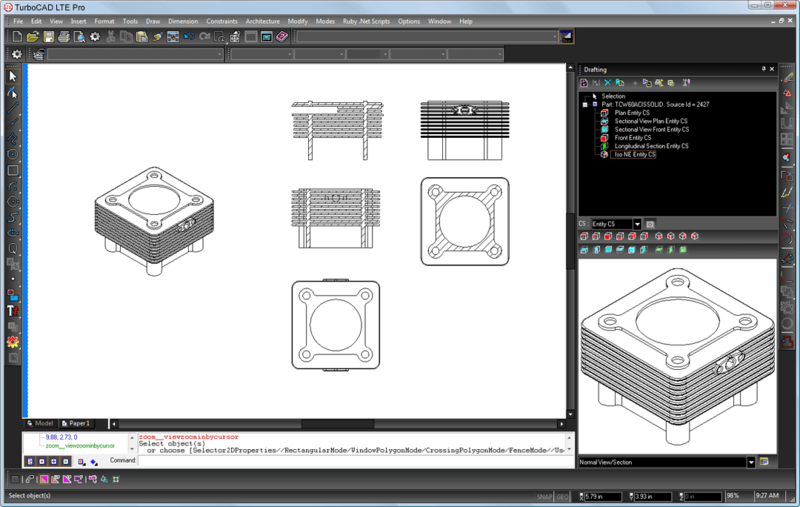 The Drafting Palette is one of the most powerful features for advanced drafting and detailing in TurboCAD LTE Pro. It works with solid or surface models, turning 3D designs into associative 2D views and detailed sections in a single click, even when working on an Xref. This means your sectional views and elevations in layout (paperspace) will update automatically as the model changes. These object views can also be dimensioned and annotated rapidly. For added productivity, Drafting Palette items may be locked, essentially caching them until unlocked. This allows modeling to continue at speed – particularly important with larger models that have numerous sections, elevations, and views. Each section may be regenerated individually or all simultaneously. Geometric constraints determine the relationship of two pieces of geometry with each other. The D-cubed constraint engine in TurboCAD LTE Pro gives you greater control and productivity, empowering your creativity. By setting up geometric and dimensional constraints, you can enforce design intent, making it easier to very quickly modify a design. Use constraints to get more done, create part families faster, incorporate red-line changes more quickly, and have the flexibility to easily evaluate different designs. 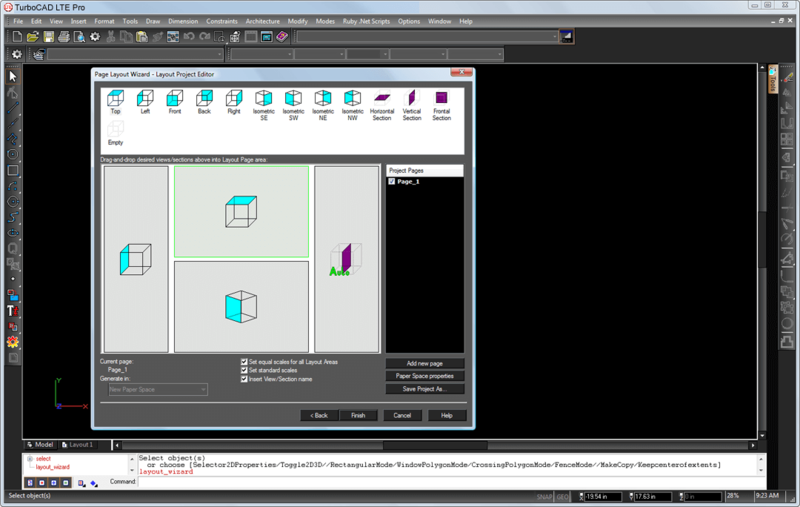 The TurboCAD LTE Pro Page Layout Wizard makes for rapid creation of 2D layouts from an existing 3D model. Two modes are provided to facilitate optimum results for either Architectural or Mechanical models. Layout preferences can also be saved for later use. All of the file formats that may be opened and imported, with the exception of bitmap images, may be used as an external reference (Xref). For example, you can continue to work in AutoCAD or SketchUp, while the drafting continues in TurboCAD LTE. This helps to minimize duplication of geometry, making editing more efficient and helping to keep drawings in synch. Xrefs also help keep file sizes down when you use the same large components in multiple drawings, and allow for concurrent sharing of data. Attach data to any object and extract data from any object. Organize and compile output to tables, spreadsheets or databases. You can even extract attributes, including blocks and xrefs, and show visible properties only. Add dimensions to an object through a viewport in paperspace and the dimensions will update if the model changes. Create custom Entity Marks to track, or count, objects. Use Property Sets to add custom information for the objects. You can also add information using Multi-View blocks, composites of blocks that can vary their appearance depending upon the viewpoint. TurboCAD LTE users can derive point data from the geometry in models and drawings and export the data in a standard CSV format. 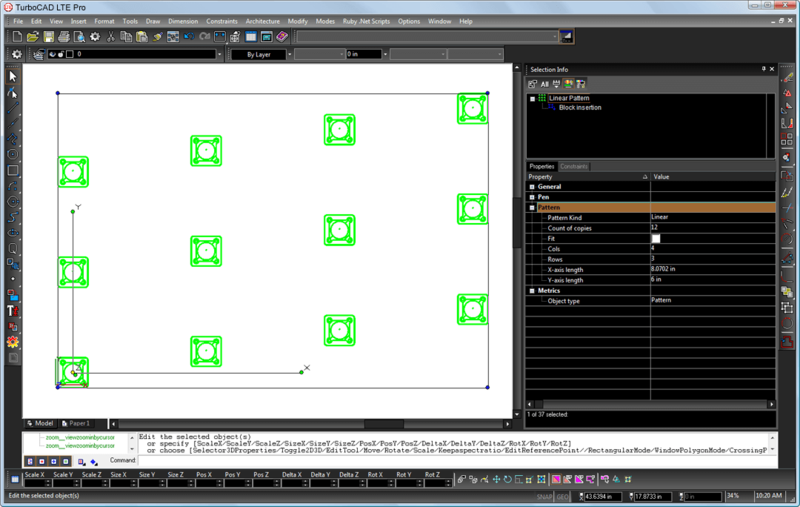 Use TurboCAD’s Associaive Arrays/Pattern tools to rapidly create parametric patterns from 2D Objects and 2D Blocks. Customized text formatting for dimensions includes bolding, superscript, subscript, italics, support for multiple font scales, and multi-line. When a drafting object is too large to display fully, TurboCAD LTE Pro users can a break gap to abbreviate the displayed object. Adjust break line properties including type (straight, zig-zag, wave, or heartbeat), gap value, color, and extension length. 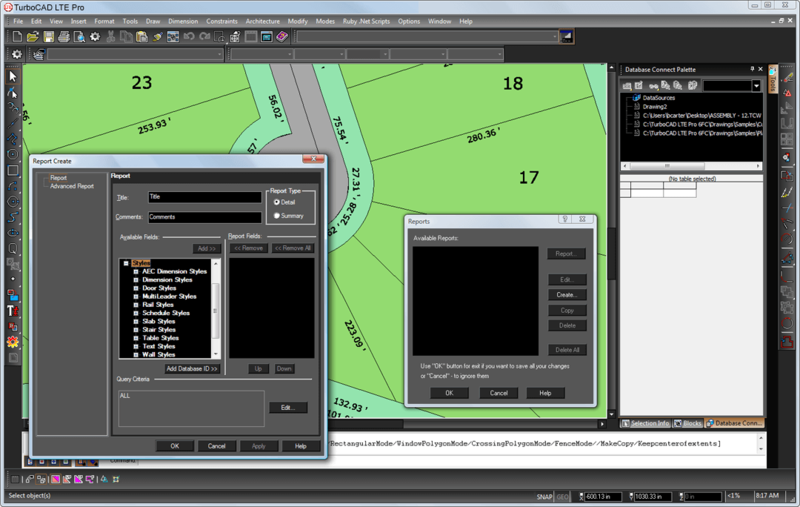 One break line per drafting object is supported.